Her name is Lilly (though she has a Punky Brooster look going on this week). I do believe I have spent more than 500 dollars in the last six months on this same paw. She chews, and chews, and chews for any ol' reason on any ol' body part. She made her latest vet visit this weekend where she was given MORE steroids, an allergy shot, and advice on dieting. Maybe I can save money on food to pay for these additions. This was NOT in the budget....or rather, the LEVEL of expense was not in the budget. It's a good thing she is so cute. I saw this in Family Fun Magazine (online, I stopped taking it, only because I was trying to be financially responsible, but it has the best ideas). I had left over chocolate from a few past projects, and there are always bananas in my house, and chocolate chips (I don't know why). They used popsicle sticks, but all I had were the sucker sticks something else I have in abundance at the house), it's the same idea. They were good, but I like the strawberry ghost best. In addition, you are supposed to freeze the banana for three hours before you melt the chocolate, and as soon as the chocolate hit the frozen banana is got solid, so it wasn't easy to smooth it out and make it look very good. I'm not that serious about this idea so I didn't try to correct that....but it's pretty fun to turn all these fruits into spooky treats just because I can. I can't believe I didn't take any pictures last night, BUT I know others did, and I can't wait to see them. I went out to Hacienda Ranch last night to celebrate Maggie's birthday with a crush of friends, and family who came with the same intention. She's looking fabulous for forty (well, give her one week, but I'm sure she still will), and a good time was had by all. Until I get my hands on some pictures, here's the gift (all decked out with 70's/80's goodies in memory of our younger years). 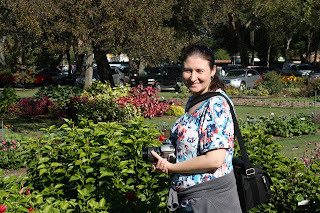 This year, I headed out to the Arboretum for Nicole's birthday tea. We discovered this fun outing last year in honor of her 30th birthday http://christyrobbins.blogspot.com/2008/10/harvest-tea-at-arboretum.html, and this year we were joined by her Mom and sister. :O) It was one of the ONLY beautiful days so far since they brought out their fall decorations, and florals. I went after Saturday School, and arriving after noon, I had to park a few miles away and be bused in to the arboretum. It was well worth the crowds. 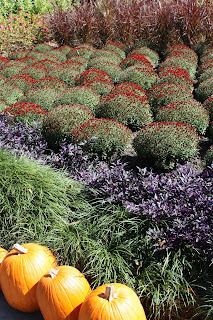 I love the colors, the pumpkin lined walks, and, of course, the tea-the food is delicious, and our waiter (the same one as last year) is fabulous. We also had some interesting, well dressed ladies at the table across from us. I love hanging out with Nicole for many reasons, but I can't help but appreciate that she takes lots of pictures too, so this go 'round she has the people pics, and macro etc on her camera. I know they will be great, and I can't wait to see them. Here are a few more of my photos in the meantime. I mostly just walked around and appreciate the day, and Nicole had to do all the hardwork. That's what friends are for! Yay, for birthdays, and beautiful days, and eating a little too many sweets! I've been super busy (in mostly good ways) this month with meetings, and projects (not listed on this blog b/c they are way too boring!). I can't believe that looking forward, I can see November! This week I even sat down and made my list for Christmas dinner. This is not unusual...I love to make it early so that I can buy it over time, and it doesn't 'hurt' quite as bad ;o), but it's about 'that time.' I also made budget number #2 for my Dave Ramsey class. So far, so good. Responsible spending sure makes life a little less exciting, but I'm pretty sure that's not a good thing (the economically strained 'exciting' life). It's like the instant, fictional, gratification of sin, and the long term effects of the guilt. I know this is better for me, and I can't say enough about how much I am getting out of the classes. We have five more weeks to go! I'm sure it's a class I'll even considering taking again in a few years when I'm at a different place financially! I'm learning to live with a budget that I can adapt to things that are important to me. The idea is to live very moderately now so that you have a lot less stress in the future, BUT I also realize there are only so many trips around this sun, and so I don't want to have regrets in ten years from now, so I'm just reprioritizing what is important....buying fewer gadgets, and skipping the sparkle tulle (I'm still bitter about letting that one go)...but....vacations are still on--->and speaking of, I just booked spring break! Yay! I'm headed to Florida to visit Maurine and Derek's baby (coming to a nursery (not so) near me-January 2009), AND Mom and I found a great deal on a cruise to the Bahamas. It's a four day journey, and we've been planning on 'some' beach vacation since she finished up her surgeries last year to celebrate. We found a price we liked, but by the time we called, it had moved up a little bit in price, I pulled out a little Dave Ramsey, and asked for the original price, and low and behold, it worked! It's a much longer story than that, but.....I'm so excited about the vacation, and about the baby holding. And thus completes the section of my blog titled: Something other than crafting, and cooking. I had to have the brownie pop pan from Wilton when I saw the book of ideas (which I did not buy). The pops are just 'all right' tasting (maybe a little dry), but I'm sure I can use the mold for a ton of other edible ideas, including mini cakes or chocolates that I can decorate with the same cute ideas. I don't want to think too hard on it right now, or I'll never stop making (eating) desserts. I used left over icing to create these iced characters....so....all I had to do was bake the brownies. I'm sure I'll revisit it again someday, but....now on to my next find. I bought some large wooden buttons and sewed them down the middle. I made a tail out of a piece of 'fur' looking fabric I bought at the fabric store. I made some ears out of felt that I stuff with cardboard, and stuffing, and then I added a crown to the top, made out of gold cardstock and more fur. He also is going to be wearing white sweatpants, and these gloves I've attached little 'claws' too, but he can remove them if they get too hot. I found a lot of great ideas online when trying to come up with some ideas for this one. Heather found the white sweatshirts with hoodies at Academy, and I bought a bunch of felt etc, and glued/sewed pieces together to make it as 'owl like' as possible. 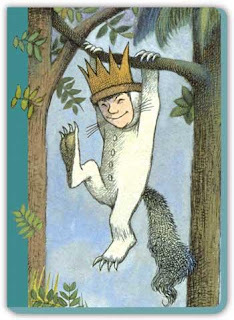 Her son is going to wear white sweatpants with the outfit as well to complete the 'snow-white owl' look. A few costume 'props' for Gretchen's boys. The youngest plans to be a dog, so he got a bone. I sewed it out of felt, and stuffed, and then attached a ribbon so it can be worn around his neck. 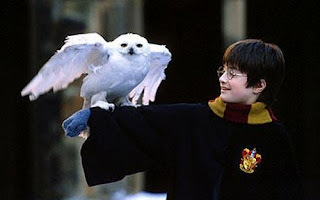 Her oldest boy is going to be Harry Potter, so he got a "Hedwig" to take with him as a prop. They have some really cute, feathered birds online, but my goal was just to make one as durable as possible, so all the feathers are felt. This is what happens when you chew on your paw (All of this because I have some garage sale stuff that I'm storing in my backyard until the school sale in a month, and Lilly doesn't like change, it freaks her out. She wouldn't even GO outside for the first week, and now...only sometimes-it's a kid's plastic slide, and some lawn chairs-VERY scary). The problem is 'the lampshade' only stays on long enough for a photo b/c if she can't get it off (and she can), her other two furry friends will. Nobody gets to be a part of anything different that doesn't include their two closest furr friends. I predict another vet visit in the future. Next week is payday, and I quickly remembered last month I forgot 'dog' in the budget line....there needs to be some adjusting this month. Cancel Christmas shopping, my dog suffers from anxiety. I saw this idea on the Taste of Home website. Tomorrow I have to take another 'Boo' to work for someone I know likes to stay healthy. OK....it's still chocolate, but does it count if there is fruit underneath? Whatever, they are fun, and it's as close to healthy as I could get with Halloween treats. I also had everything, but the strawberries, so they were easy to put together. I've never had white chocolate covered strawberries, and I discovered I liked them even better with white chocolate! I borrowed this picture from the Taste of Home site, (I was lead to this by the same magazine I've been working through for awhile, it's been great). This was the food trial of the week, and it was actually really good, so I'm sharing. It's just another variation of things that are so good on cold days. It's sort of like a frito pie/chili/fiesta salad. I did HALF the recipe (with a few variations to follow), which was enough to feed probably five or six, the meet went further than the chips and rice, but that's b/c I love carbs). I just did half an onion (instead of one), 1 lb of meat, 1 tomato, and the whole envelope of seasoning, the rest I halved, and it was good. Here is the original recipe that supposedly feeds twenty....I'm not so sure about that! I'd for sure add more rice, and fritoes if that is the case. In a Dutch oven or large skillet, cook beef over medium heat until no longer pink; drain. Add beans, tomato sauce and chili seasoning; simmer for 30 minutes, stirring occasionally. 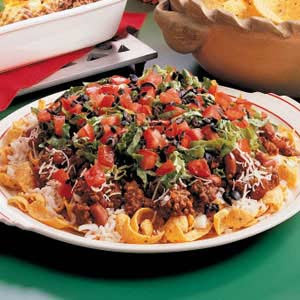 On two serving platters with sides, layer the corn chips, rice, onions, meat mixture, cheese, lettuce, tomato and olives. Sprinkle with hot sauce if desired. I made this cake this weekend for a 30th anniversary party. 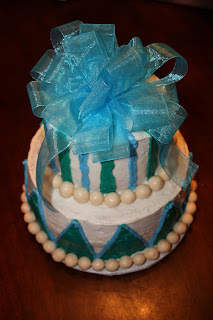 They asked for an aqua cake, and seemed to want it a little funky. 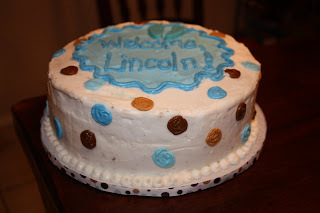 I used vanilla whoppers instead of fondant for the balls on the side of the cake. Hopefully it will be more tasty this way! 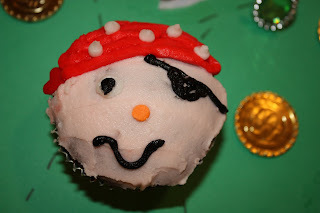 Gretchen's oldest is having a pirate party today. 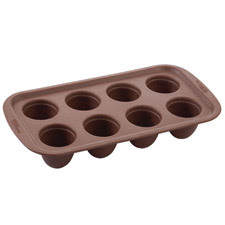 I found a photo of these online to guide me in the cupcake making process. 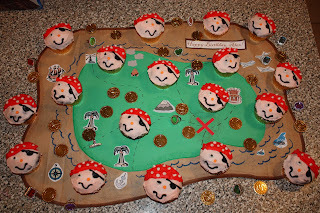 I used big, red, heart sprinkles for the 'tie' on the bandana, and when I ran just low enough on icing that noses weren't possible to pipe (it's hard to 'rematch' a color), I found some orange sprinkles for noses, and then, of course, gold cupcake holders. Here are half of them on a little treasure map I put together to anchor them all down, with a few little gold pieces and jewels strewn around. The other half jumped ship (or rather, wanted to sit in their box until delivery, but you get the point! -Who's idea was it to let me loose in Michael's without supervision? -Does anyone want a 8 year old lab that just ate the Petit Fours I set out to ice into little ghost-Martha Stewart Style (a project two years in the making (only because I never got around to it last year))? It looks like it'll be a project three years in the making b/c I just don't think I can bring myself to put the ghost together again (nor Humpty Dumpty while we are at it), but I will email a picture of them next year to you, and your new, old-dog. -I knew sleep was overrated. I made three cakes last night, and I was so proud of getting it all done with a (sort of good attitude, minus one little "I wish this kitchen was bigger mini-whine) then put together the Petit Fours, minus the icing, and decided to be relatively responsible and head to be at 3 am (as responsible as I get about these sort of things), but then....no sleep came, and the ghost disappeared....spooky. -Is there any reason I can't sleep until Sunday about 4? After trying to go to bed, my dog kept me up the rest of the night because she suffers from anxiety and was listening to the storms, which I would have been enjoying listening to if it weren't for aforementioned dog. -Speaking of...first dog mentioned who ate my ghost also ate second dog's bottle of anxiety drops, sure, they didn't work, but there was hope with each little drop that went down second dog's throat that they might kick in at some point. -Can you list 97 good reasons I don't need to buy all the sparkle tulle on the racks at Joanne's? I heart it to the 97th power. -Can anyone think why it would be a good idea to buy brownie pop molds to make witch's brooms when I just scratched the ghost petit fours out of the to do list because of dog complications? 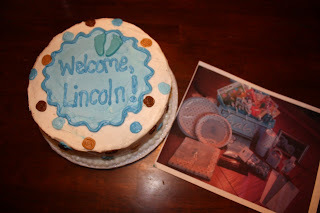 Baby Boy's Shower Cake-Made to Match the Plates. 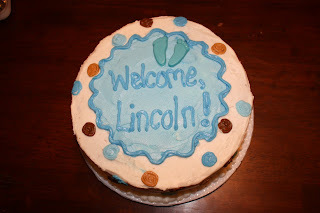 Welcome, Lincoln! See, it matches the decorations! 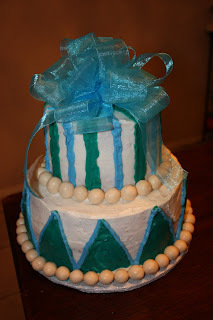 A View from the side-I was so excited to find some ribbon that matched! 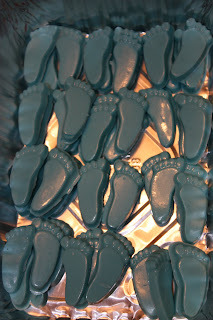 Lincoln's Grandmother really likes baby footprints. I found this chocolate mold, and made enough to be served with each slice of cake, plus put a little set on top of the cake to match some of the confetti decorations the hostesses bought. For anyone that is bored with the same old dishes, I've been working through the Taste of Home Sunday Supper magazine, and the recipes have all be OK, but I made one last night I'd definitely make again: Pizza Stromboli! I didn't add anything but the cheese and pepperonni to the inside (only because I didn't have anything around to make it more of a 'supreme.' I also just used some 'regular' speghetti sauce in the dough instead of pizza sauce (so I could use it later in a pasta dish), and instead of dry milk (thanks Maggie for the suggestion) I used carnation coffee creamer (the box of dry milk was 8 dollars, and I've never used it before, and probably will not use it again). I also sprinkled the top with cheese, but added some 0 Calorie spray butter, and garlic salt to the top as well. I took a picture, but it turned out weird, and then we ate it, so now there's nothing to photograph, but I borrowed one from a site online that gives you the basic idea of what the inside looked like, and the whole thing just looks like a little loaf of bread baking. Here is the recipe for the bread. Stir in honey and milk powder until well blended. In a small bowl, combine 1 cup bread flour, whole wheat flour and seasonings. Add to yeast mixture; beat until smooth. Stir in enough remaining bread flour to form a soft dough. Turn onto a floured surface; knead until smooth and elastic; about 6-8 minutes. Cover; let rise in a warm place until doubled, about 1 hour. Turn onto a lightly floured surface; roll into a 14-in. x 12-in. rectangle. Sprinkle pepperoni, 1/4 cup cheddar cheese, Parmesan cheese, 2 tablespoons mozzarella cheese, onion, olives and mushrooms to within 1/2 in. of edges. Roll up jelly-roll style, starting with a long side; pinch seam to seal and tuck ends under. Bake at 350° for 25-30 minutes or until a toothpick comes out clean. Remove from pan to a wire rack. Refrigerate leftovers. Yield: 1 loaf. This was the end of Holly, and I's summer musical experience, and it's been a great one. Mary Poppins was one of the cutest plays all season. It's a graet show for little ones, I recommend it-100% for families. There were so many fabulous stage tricks, tapping on the ceiling, kite flying, the famous carpet bag and....stop reading here if you don't want it ruined....Mary Poppins floats up over the audience as far out as the balcony seats, and up through a trap door in the top at the end. The second half is by far the best....it was just too cute! The bonus was that because the music hall is one of the buildings on the fair grounds, we got into the fair for free, yay! The play didn't start until 8, so we went down a few hours beforehand and got to look around the fair...and eat. 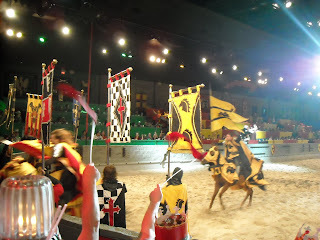 My Mom took this photo tonight when Holly, Mom, and I attended Medieval Times Games and Tournament. I've been quite a few times (twice when I was younger), and three times on field trips with my sixth graders (the perfect field trip-kids are encouraged to scream, and they never disappointed), though it's much more enjoyable when you aren't in 'charge' of anyone, and the food is more of a 'feast' at the 'regular' dinner show. Everything is served by wenches and serfs and is eaten with your hands. I can never remember when someone ask, so for the record the meal included: Tomato Bisque, Garlic Bread, Roasted Chicken, Ribs, Roasted Potato Half ("A Dragon's Egg"), and an Apple Pastry. They do bring a warm towel to wipe down your hands, but no silverware. They also serve two servings of Pepsi, or Tea, and one cup of Coffee. And then they sell, sell, sell drinks, toys, flags, and everything, and anything glow in the dark. The show does seem to change through the years, so....it's not the same old same old, but the idea is the same-tournament, and games-medieval knight style. :O) We were in charge of cheering on the red knight this evening, and were fortunate to sit with a rowdy crowd! They had a great deal on tickets (thanks, Gretchen for the info) online, but they are also running some specials right now through them directly. 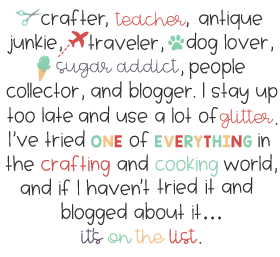 My Mom put it on her 'to do' list (the one I forced her and Holly to make at one time, and now I wander around finding ways to make them start fulfilling their list, but I can use the excuse that it's 'their' list if they start accusing me of being bossy! ), and so I got tickets for her birthday. We did come home sans any knights and shining armor, but we came home happy, and full, and most nights-that's enough! 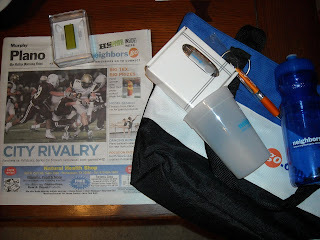 I got to pick up my ipod nano on Friday downtown at the newspaper headquarters, and meet some of the staff that works on the NeighborsGo section. They were all very kind, and they even put together a bag of loot to go with the ipod. What a wonderful experience, I'm so grateful! 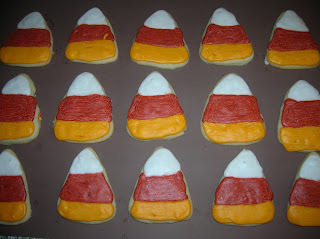 I saw some cookies that looked similiar to this last Halloween in Swoozies (the cutest store EVER). I filed this information away in my brain to pull out this year. 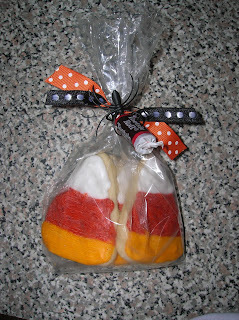 I think candy corn is the cutest, and I can smell a bag every hour on the hour for a month, and eat a bag in an hour. I baked my first (of several planned) Halloween treat(s) this week. I'm helping start a little energizer at work by giving these away to my Boo Pal at work. The idea is that she won't know who gave them to her, just some ghost, but then she gets something and 'spooks' another person at work, and so on until we have all been "Boo"ed (Ghost will be left on our door). 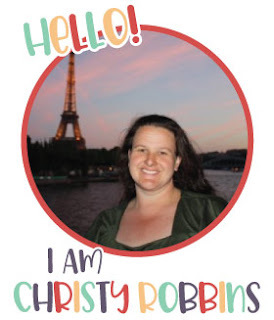 Most of my friends don't have my personal blog, so I guess it's safe to post here. :O) I don't think I got the orange exactly right, but who cares, the idea is exactly right!